I can show my work so that a reader understands without have to ask me questions. Use and connect mathematical representations: Effective teaching of mathematics engages students in making connections among mathematical representations to deepen understanding of mathematics concepts and procedures and as tools for problem solving. Gough, Jill, and Jennifer Wilson. “#LL2LU Learning Progressions.” Experiments in Learning by Doingor Easing the Hurry Syndrome.WordPress, 04 Aug. 2014. Web. 11 Mar. 2017. How might we deepen our understanding of numeracy using children’s literature? What if we mathematize our read aloud books to use them in math as well as reading and writing workshop? Have you read Sheep Won’t Sleep: Counting by 2’s, 5’s, and 10’s by Judy Cox? This week’s Embolden Your Inner Mathematician session is designed to learn and practice both a Mathematics Teaching Practice and a Standard for Mathematical Practice. Effective teaching of mathematics engages students in solving and discussing tasks that promote mathematical reasoning and problem solving and allow multiple entry points and varied solution strategies. Jennifer Wilson and I use the following learning progression to help teachers and teaching teams calibrate their work. critique the reasoning of others. Mathematically proficient students understand and use stated assumptions, definitions, and previously established results in constructing arguments. Elementary students can construct arguments using concrete referents such as objects, drawings, diagrams, and actions. Such arguments can make sense and be correct, even though they are not generalized or made formal until later grades. Students at all grades can listen or read the arguments of others, decide whether they make sense, and ask useful questions to clarify or improve the arguments. We choose to reword this for our students. Instead of I can construct a viable argument, we say I can show my work so a reader understands having to ask me questions. We use the following learning progression to help students self-assess and reach to deepen their learning. We also practiced a keep the pace up and get kids collaborating instead of relying on the teacher strategy we are learning from Elizabeth Statmore. Instead of 10-2 processing, we took a minute after every couple of pages to intentionally turn and talk with a partner with the express purpose of comparing and improving our notes and mathematical communication. Here’s a messy version of how we anticipated student work and thinking. These read-aloud moments open up the opportunity for rich discussion and engaging questions. Students have the opportunity for more organic and deeper understanding of mathematical concepts thanks to the book that brought them to life, and it is an engaging way to look at math through a different lens. Boaler, Jo. Mathematical Mindsets: Unleashing Students’ Potential through Creative Math, Inspiring Messages and Innovative Teaching (p. 115). Wiley. Kindle Edition. Leinwand, Steve. Principles to Actions: Ensuring Mathematical Success for All. 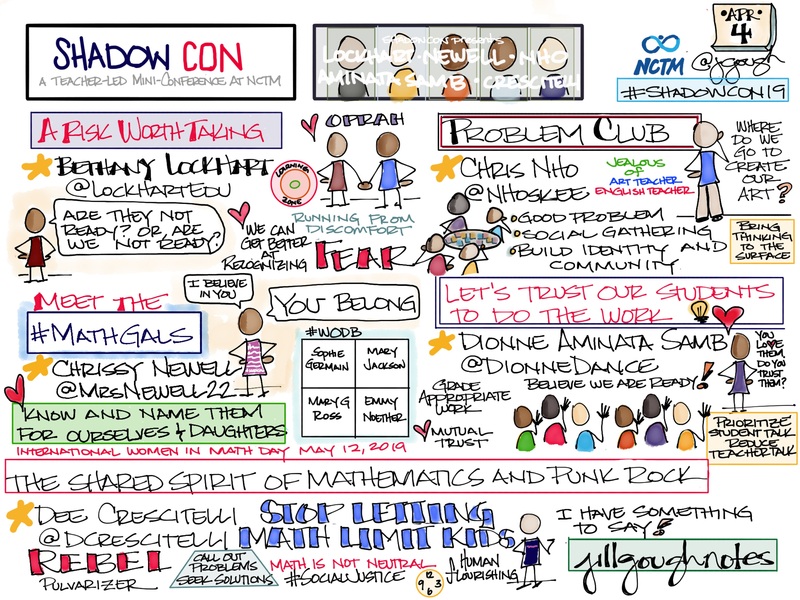 Reston, VA.: National Council of Teachers of Mathematics, 2014. Print. “Standards for Mathematical Practice.” Standards for Mathematical Practice. N.p., n.d. Web. 15 Dec. 2014. Statmore, Elizabeth. “Cheesemonkey Wonders.” First Week and AVID Strategies. 25 Aug. 2018. Worry in her beautiful, tired, sad eyes communicates so much. Strain across her face makes my heart ache. As we sit down for coffee with our children playing nearby, she blurts, “I don’t know how to make myself clearer, Jill. They just don’t, won’t, can’t – I don’t know – get it!” I sigh into my coffee which causes steam to fog up my glasses, and she laughs through her tears. Knowing that I am an evidence-interested educator, she pulls out her unit plans for me to see and offer feedback. “You were in our class yesterday. What I can I do better…? How do I help them learn?” Love and concern for her students is evident in her thoughtfulness, craftsmanship, and design. I was in this class yesterday and had been for many days of the unit. I go again and again, because I am learning from her and with her students. This strong, organized, empathetic teacher is, in fact, a very good teacher. Sitting there on the bank of the Chattahoochee, occasionally interrupted, joyfully, by a toddler that needed to show us a valuable rock or other important discovery, we combed through student work. Outpouring concern and frustration, she talked about each learner, their strengths, and what surprised her about what they did not understand. I listened in awe of what she knew about her students in granular detail, and what she thought they knew but didn’t really. My notes highlighted every success she saw and the joy and pride she felt with every success. How might we shift her work to increase the amount of success for her and her students? How might we empower learners to take action, self-assess, and ask questions early and often to improve their understanding and communication? What if we take what we just learned about her class and level it out to make her expectations and her thinking visible? “As soon I as finish explaining the task, they are all over me, Jill. They have no idea what to do or are too scared to get started. They want me to hold their hand. They are not empowered or safe enough to try.” They are splashing around in the shallow end, maybe even thrashing. “They are happily working along and find success.” They are willing to work in the pool, but need support build around them to know this is a safe, brave space to draft and redraft to think and learn. Mistakes are opportunities to learn; they do not define you. “They are first and fast and successful. They want and need more. I want to deepen and connect their learning, not broaden it.” They are willing to dive into the deep end confidently to explore new connections and representations. This hard, important work helped us gain clarity about what is essential to learn in her classroom. Articulating frustration points as well as success points during her analysis of learning in her classroom revealed and organized a path for communication of learning intentions. How might we empower and embolden our learners to ask the questions they need to ask by improving the ways we communicate and assess? What if we make our thinking visible to our learners? What if we display learning progressions in our learning space to show a pathway for learners? But, as a learner…What if I think I can’t? What if I’m stuck? What if I feel lost, confused, or discouraged? How might we offer a pathway for success? What if we provide cues to guide learners and inspire interrogative self-talk? NCTM’s recent publication, Principles to Actions: Ensuring Mathematical Success for All, calls us to support productive struggle in learning mathematics. How do we encourage our students to keep struggling when they encounter a challenging task? They are accustomed to giving up when they can’t solve a problem immediately and quickly. How do we change the practice of how our students learn mathematics? How might we coach our learners in to asking more questions? Not just any questions – targeted questions. What if we coach and develop the skill of questioning self-talk? Our coffee is cold and our children have lost interest in playing together. As we wrap up our reflection, feedback, and planning session, we agree to experiment the next week with her students. How might the work and learning change if we make a pathway for self-assessment and self-talk visible to the learners? We plan to post #LL2LU SMP-1: I can make sense of problems and persevere in solving them in the classroom and on the tables for easy reference. Our immediate learning goal for the students is to make sense and persevere, to ask clarifying questions and try again, to show thinking for clarity and questioning, and to find multiple ways to solutions and find connections. Hattie, John A. (Allan); Fisher, Douglas B.; Frey, Nancy; Gojak, Linda M.; Moore, Sara Delano; Mellman, William L.. Visible Learning for Mathematics, Grades K-12: What Works Best to Optimize Student Learning (Corwin Mathematics Series). SAGE Publications. Kindle Edition. Lichtman, Grant, and Sunzi. The Falconer: What We Wish We Had Learned in School. New York: IUniverse, 2008. Print. Pink, Daniel H. (2012-12-31). To Sell Is Human: The Surprising Truth About Moving Others. Penguin Group US. Kindle Edition. I can show my work so a reader understand without asking me questions. Use and connect mathematical representations:Effective teaching of mathematics engages students in making connections among mathematical representations to deepen understanding of mathematics concepts and procedures and as tools for problem solving. I can use and connect mathematical representations. I can use and connectmathematical representations. What if we engage in purposeful instructional talk as a team to focus on the instructional core? How might we design and implement a differentiated action plan across our grade to meet all learners where they are? What if we learn to integrate Smith and Stein’s 5 Practices for Orchestrating Productive Mathematics Discussions? High-level tasks not only hold high mathematical expectations for every student, one aspect of equitable classrooms, they also “allow multiple entry points and varied solution strategies” (NCTM 2014, p. 17). Gough, Jill, and Jennifer Wilson. “#LL2LU Learning Progressions.” Experiments in Learning by Doing or Easing the Hurry Syndrome.WordPress, 04 Aug. 2014. Web. 11 Mar. 2017. Smith, Margaret, and Mary Kay Stein. 5 Practices for Orchestrating Productive Mathematics Discussions.The National Council of Teachers of Mathematics, 2018. I can useand connect mathematical representations. What do the standards say? Add and subtract within 1000, using concrete models or drawings and strategies based on place value, properties of operations, and/or the relationship between addition and subtraction; relate the strategy to a written method. Understand that in adding or subtracting three-digit numbers, one adds or subtracts hundreds and hundreds, tens and tens, ones and ones; and sometimes it is necessary to compose or decompose tens or hundreds. Fluently add and subtract within 1000 using strategies and algorithms based on place value, properties of operations, and/or the relationship between addition and subtraction. 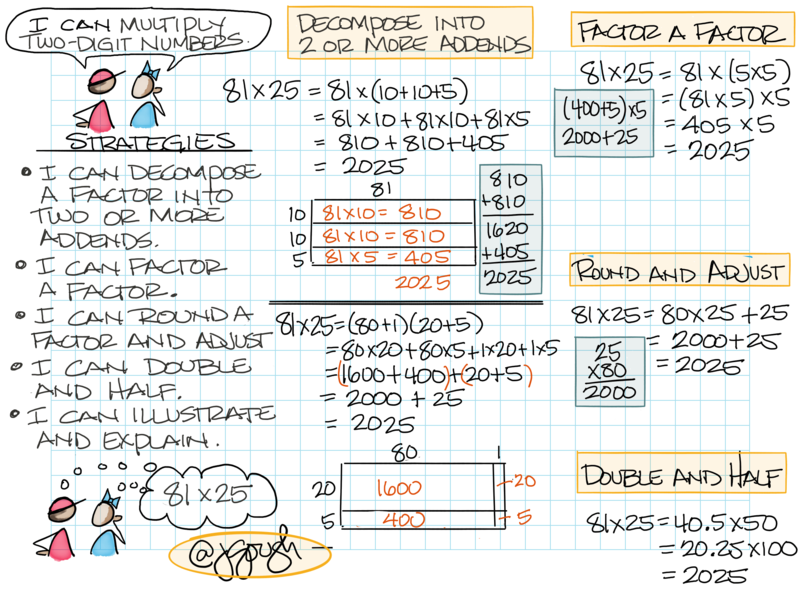 Fluently add and subtract multi-digit whole numbers using the standard algorithm. 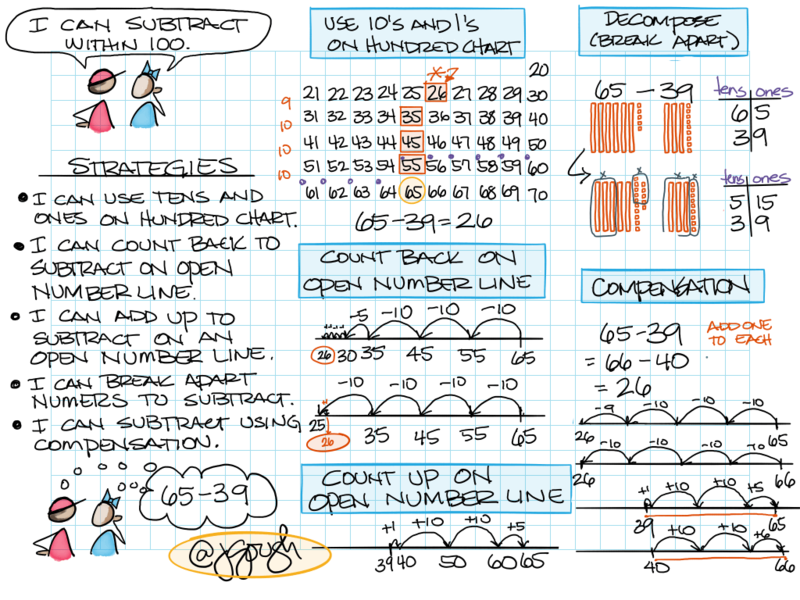 Multiply one-digit whole numbers by multiples of 10 in the range 10-90 (e.g., 9 × 80, 5 × 60) using strategies based on place value and properties of operations. “Number & Operations in Base Ten.” Number & Operations in Base Ten | Common Core State Standards Initiative, National Governors Association Center for Best Practices and Council of Chief State School Officers. We strive to grow in our understanding of the Eight Mathematics Teaching Practices from NCTM’s Principles to Actions: Ensuring Mathematical Success for All. This research-informed framework of teaching and learning reflects a core set of high leverage practices and essential teaching skills necessary to promote deep learning of mathematics. Elicit and use evidence of student thinking. Effective teaching of mathematics uses evidence of student thinking to assess progress toward mathematical understanding and to adjust instruction continually in ways that support and extend learning. In order to support our teaching teams as they stretch to learn more, we drafted the following learning progressions. We choose to provide a couple of pathways to focus teacher effort, understanding, and action. When working with teacher teams to elicit and use evidence of student thinking, we refer to 5 Practices for Orchestrating Productive Mathematics Discussions by Peg Smith and Mary Kay Stein and Dylan Wiliam’s Embedding Formative Assessment: Practical Techniques for K-12 Classrooms along with Principles to Actions: Ensuring Mathematical Success for All by Steve Leinwand. To deepen our understanding around eliciting evidence of student thinking, we anticipate multiple ways learners might approach a task, empower learners to make their thinking visible, celebrate mistakes as opportunities to learn, and ask for more than one voice to contribute. 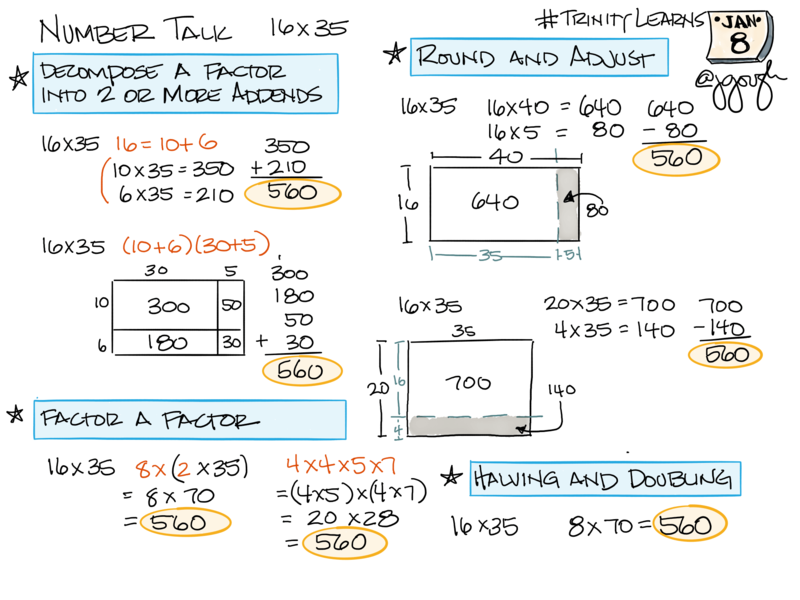 From NCTM’s 5 Practices for Orchestrating Productive Mathematics Discussions, we know that we should do the math ourselves, anticipate what learners will produce, and brainstorm how we might select, sequence, and connect learners’ ideas. How will classroom culture grow as we focus on the five key strategies we studied in Embedding Formative Assessment: Practical Techniques for F-12 Classrooms by Dylan Wiliam and Siobhan Leahy? To strengthen our understanding of using evidence of student thinking, we plan our hinge questions in advance, predict how we might sequence and connect, adjust instruction based on what we learn – in the moment and in the next team meeting – to advance learning for every student. We share data within our team to plan how we might differentiate to meet the needs of all learners. How might we team to strengthen and deepen our commitment to ensuring mathematical success for all? What if we anticipate, monitor, select, sequence, and connect student thinking? How might we elicit and use evidence of student thinking to advance learning for every learner? Stein, Mary Kay., and Margaret Smith. 5 Practices for Orchestrating Productive Mathematics Discussions. N.p. : n.p., n.d. Print. Wiliam, Dylan; Leahy, Siobhan. Embedding Formative Assessment: Practical Techniques for F-12 Classrooms. (Kindle Locations 2191-2195). Learning Sciences International. Kindle Edition. Establish mathematics goals to focus learning. Effective teaching of mathematics establishes clear goals for the mathematics that students are learning, situates goals within learning progressions, and uses the goals to guide instructional decisions. When working with teacher teams to establish mathematics goals to focus learning, we refer to 5 Practices for Orchestrating Productive Mathematics Discussions by Peg Smith and Mary Kay Stein and Visible Learning for Mathematics, Grades K-12: What Works Best to Optimize Student Learning by John Hattie, Douglas Fisher, and Nancy Frey along with Principles to Actions: Ensuring Mathematical Success for All by Steve Leinwand. 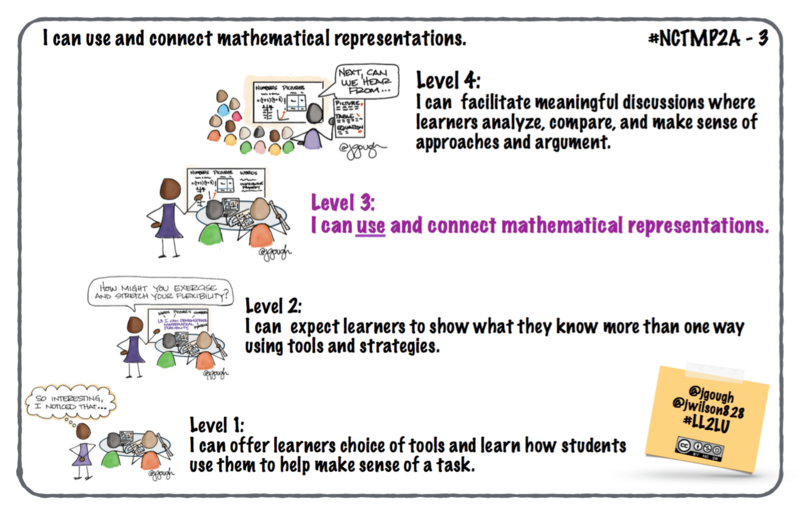 To deepen our understanding around establishing mathematics goals, we anticipate, connect to prior knowledge, explain the mathematics goals to learners, and teach learners to use these goals to self-assess and level up. 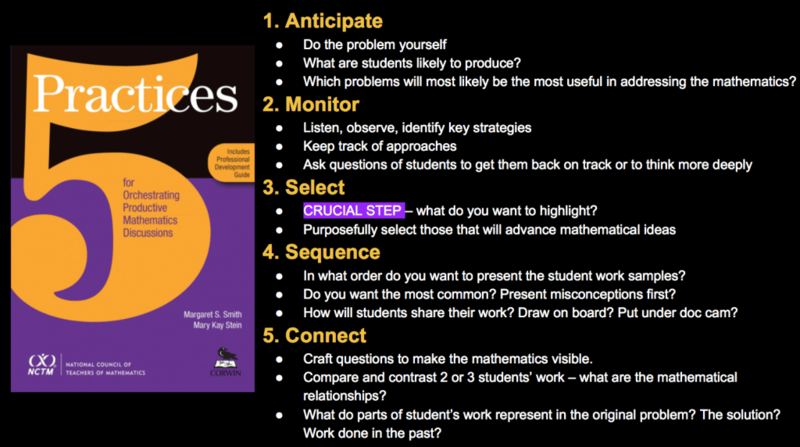 From NCTM’s 5 Practices for Orchestrating Productive Mathematics Discussions, we know that we should do the math ourselves, predict (anticipate) what students will produce, and brainstorm what will help students most when in productive struggle and when in destructive struggle. To strengthen our understanding of using mathematics goals to focus learning, we make the learning goals visible to learners, ask assessing and advancing questions to empower students, and listen and respond to support learning and leveling up. How might we continue to deepen and strengthen our ability to advance learning for every learner? 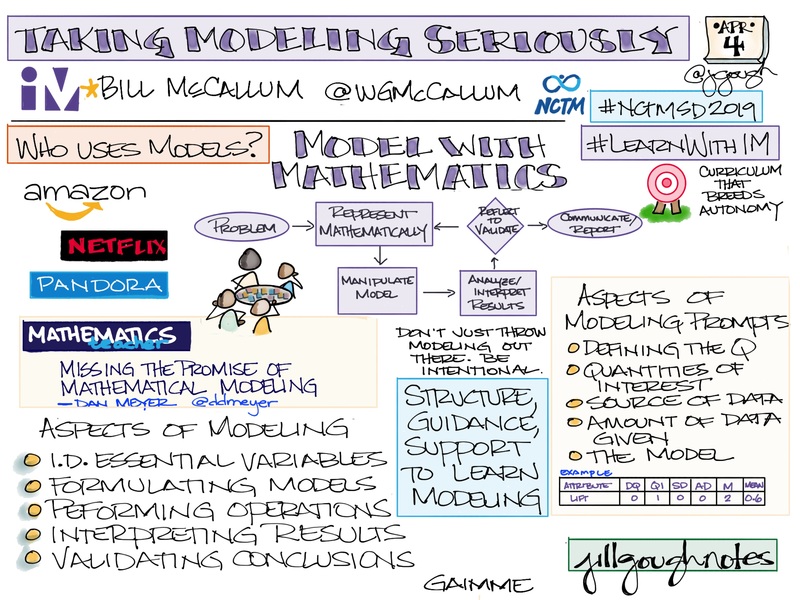 What if we establish mathematics learning goals to focus learning?